Can you tell me how to get; how to get to Sesame Street? HAPPY 1st BIRTHDAY P-Dub!!! It’s hard for me to believe that a wee little bit over a year ago, we welcomed nephew #4 into our loving arms…. But time surely flies when we’re all having fun and our little P-Dub turned 1-year-old in June! The weather was absolutely gorgeous the day of his party; tons of family and friends joined us in celebrating; I was no longer buried under Sesame Street characters as the decorations were hung; good eats were shared and the birthday boy had a BLAST! Take a peek at the fun festivities and take note of a couple of things…. The cake was made by a longtime family friend who also made lil sis’ cakes for her bridal shower and wedding. Lil sis was 8 1/2 months preggers for this party! Doesn’t she look f.a.b.u.l.o.u.s?!?!? She ended up having Jamisen 8 days later! 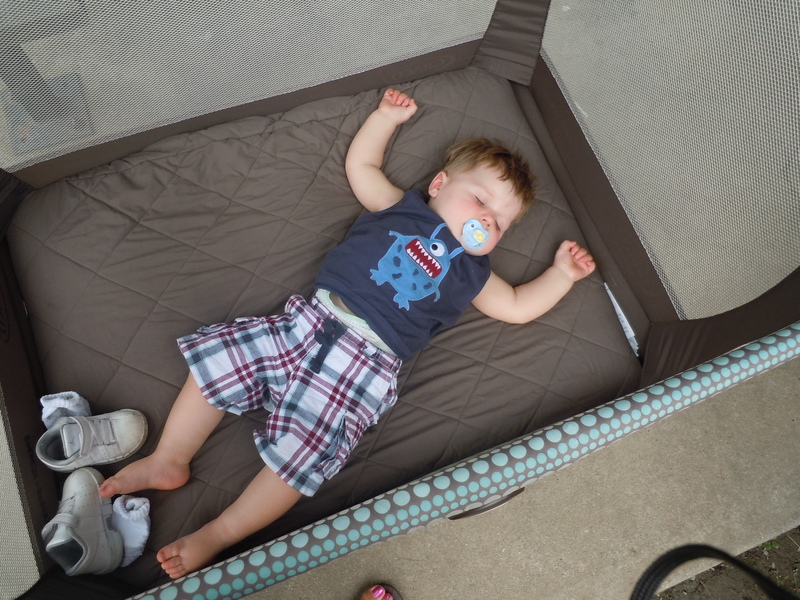 The birthday boy quite obviously had a pretty good time at his party… all tuckered out in the pavilion after going strong with NO nap in the middle of the day! It was super yummy too!